Most neck pain is due to degenerative changes that occur in the intervertebral disc of the cervical spine or the joints between each vertebra. Perhaps the most serious of the problems caused by degeneration of the cervical spine is the condition of spinal stenosis. 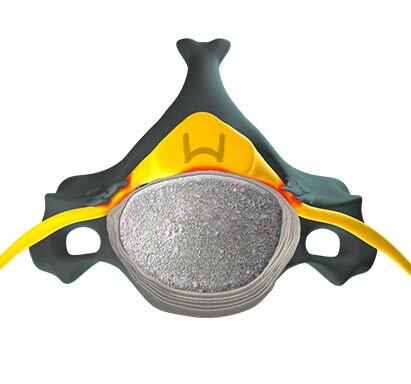 As we age, the disc loses some of its water content and as a result, some of its shock absorbing ability. It also decreases the opening in the spinal column where the nerve nerves exit (foramen). It is thought that too much motion on the spinal segment causes the bone spurs to form. Eventually the bone spurs can form around the nerves of the spine and also decrease the size of the foramen. The narrowing of the foramen can lead to neck pain and upper extremity pain, numbness, tingling or weakness. The tighter the opening for the nerve, the more symptomatic the patient will be. This is called cervical radiculopathy. When there is a narrowing of the spinal canal, the whole spinal cord may be affected. This could have the symptoms already mentioned but also, in the lower extremities, there could be numbness and weakness reported. This is called cervical myelopathy. Reflexes may be increased in the legs and strength may be lost. Walking could be compromised and the patient may refer to tripping over things and being “clumsy”. The treatment is quite different depending on the symptoms of the patient. There are several conservative measures for radiculopathy. With myelopathy, the patient should have a surgical consult due to the pressure on the spinal cord.